Here's an exhilarating way to celebrate a new year of fitness! Ring in the New Year with this invigorating solo ride, complete with hill climbing, speed intervals, and fun drills in between. The party-themed music is upbeat, occasionally downright celebratory, so don’t be surprised if you get caught up in the festive vibe and ride extra hard. Make a playlist with the following songs, then grab a towel (because you will sweat a lot!) and fill a large water bottle to keep you well hydrated. Then, get ready to start the year off right! What to Do: Sit and pedal steadily against light resistance for 1½ minutes. Transfer the work to your right leg for 30 seconds, then to your left leg for 30 seconds. Engage both legs for 30 seconds. Add a little resistance; repeat the pattern 'til the end of the song. 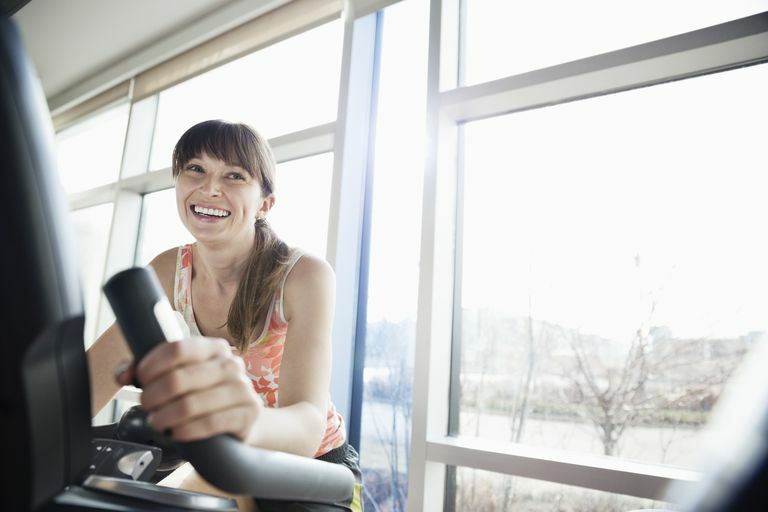 What to Do: Pedal while seated for 30 seconds then add enough resistance to support you in a standing position; bring yourself to a standing run (hands in position 3) for 45 seconds. Switch to a standing jog (hands in position 2) for 45 seconds. Return to the saddle ‘til the end of the song. What to Do: Add medium-heavy resistance and pedal in a seated position, adding resistance every 30 seconds. When you get to the point where you can’t take any more resistance in the saddle, bring yourself to a standing climb (hands in position 3) and stay there, adding resistance every 30 seconds until the song ends. What to Do: With moderate resistance (enough to support you in a standing position), find a quick baseline pace (70-80 RPMs) and pedal steadily for 30 seconds. Then perform a series of 4-count or 8-count jumps—4 counts up, 4 counts down, or 8 up, 8 down—for 1 minute. Stand, bring your hands to position 3 and run for 30 seconds. Slow down, sit, and resume the jump-run pattern for the rest of the song. What to Do: Drop some resistance from the bike so that you’re just above a flat road. Find a quick baseline pace and pedal steadily for 30 seconds. Do a 25-second speed interval, pedaling as fast as you can. Slow down for 30 seconds; repeat the pattern until the end of the song. What to Do: Add moderately heavy resistance and do a seated climb for 45 seconds. Stand, place hands in position 3, add resistance and make it a heavy standing climb for 45 seconds. Bust through the resistance by adding 10 RPMs or two pedal strokes for the next 30 seconds. Gear down to a flat road, sit and pedal steadily for 30 seconds. Repeat the pattern through both songs, making each pass through the circuit more challenging. What to Do: Against moderate resistance, find a quick baseline pace (70-80 RPMs) and pedal steadily for 20 seconds; do a 20-second speed surge (100 RPMs) then return to 70-80 RPMs for 20 seconds. Continue the pattern throughout the song. What to Do: Maintain a steady pace (70 to 80 RPMs) with moderate resistance for 45 seconds; add some resistance and keep your pace steady for 45 seconds. Increase your pace by 10 RPMs (80 to 90 RPMs) for the next 45 seconds; add a little resistance and maintain 80-90 RPMs for 45 seconds. Next, increase your pace by another 10 RPMs (to 90 to 100 RPMs) for 45 seconds; drop 10 RPMs from your pace (80-90) for 45 seconds, then drop to 70-80 RPMs until the song ends. What to Do: Have enough resistance to support you in a standing position. Pedal at a jogging pace (hands in position 2) for 40 seconds; when the tempo picks up, bring your hands to position 3 and run with the beat for 25 seconds. Slow to a standing jog again and repeat the pattern throughout the song. What to Do: Add moderately heavy resistance and pedal to the beat while seated, adding resistance every 30 seconds. After 3 minutes, stand, place your hands in position 3, and ride to the top, continuing to add resistance every 30 seconds. What to Do: Gear down to a flat road and pedal steadily for 1 minute. Keep your legs moving, sit up tall in the saddle, and take some big, deep breaths. Do a series of upper body stretches, followed by lower body stretches off the bike. Want a Solo Ride With Flexibility? Check This Out!